For a list of local groups, see the Get Involved page. There are many short films which can be shown as an introduction to what is happening at Dale Farm. A short film which documents recent experiences of evictions at sites near to Dale Farm can be downloaded from here. The Irish Travellers’ Movement in Britain has produced a DVD of Irish Traveller history and culture which is available for free via post. See their website for info. Part 1 can be accessed here, and Part 2, here. There are some films available from Travellers’ Times. Part 1 of the BBC documentary “Gypsy Wars” focusses on the struggle at Dale Farm and the director Richard Parry has revisited Dale Farm in a recent film (The Big Gypsy Eviction) shown on BBC 1, on 21st July, 2011 and will be available from the BBC website for a short period (try this link). Get in touch with savedalefarm [at] gmail.com to arrange for speakers from the Traveller Support Network to come to your info-night. Also, we may be able to suggest other possible speakers who are active in travellers’ rights and the Save Dale Farm campaign. 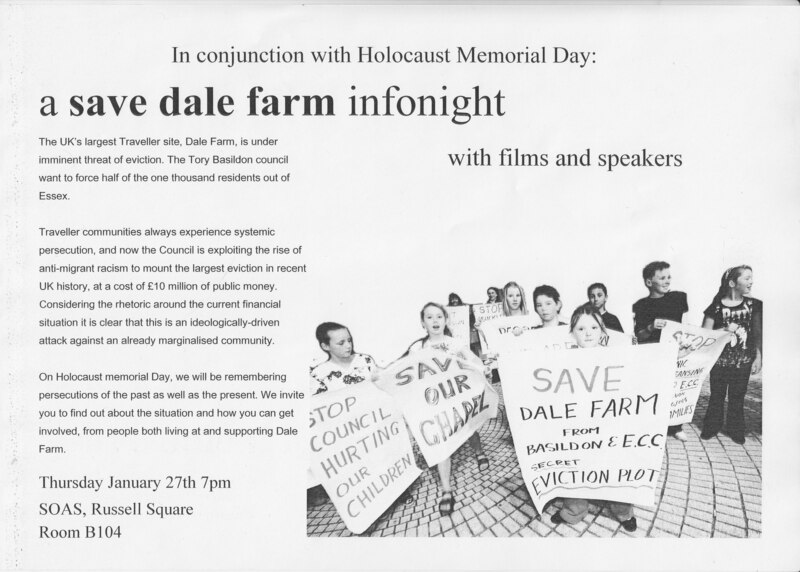 Notice the supporters of Dale farm are putting themselves out to speak on the circuit? i hope this isn’t at the expense of the Travellers speaking for themselves. That happens to often with ethnic minorities, their supporters turn into their representatives silencing the voice of those who they are supposed to help. Let the Travellers have their own voice. The welcome mats out for yehs…oops, may have been stolen! This is what she’s been ‘defending the rights of’! A bunch of con artists – rather like her! Many of the dale farm shits are connected to homes in Rathkeale, a town in the Republic of Ireland which is often regarded as a spiritual home for travellers. AND it shows the deeds and benefit claims – but it doesnt mention the ones they own in Belgium and Holland – yet….. …. “Gypsy Wars” was a great well made documentary, I very much enjoyed watching it. I think there might be a way to make sure that the police who attend this eviction are there only as peace officers and not police officers…this will men they cannot assist with the eviction but be onlookers merely to keep the peace of ALL involved..which of course also means the constant stormtroopers..